We've been checking for the Apple AirPower release date every day, but there's no need to do that anymore, as Apple has officially canceled the project altogether. AirPower, the wireless charging mat Apple revealed a year and a half ago, first showed up at the iPhone X launch event. That was September 12, 2017, or 563 days ago. It promised to Qi-charge three devices at once anywhere you laid them down on the mat. So you could simply drop your iPhone XS Max, AirPods 2019 and Apple Watch 4 onto the mat and juice them up without having to plug in any cables. Easy, right? Well, over the last 18 months, we went without an official AirPower status update and never got our hands-on time with the ambitious mat. We did, however, see a smattering of rumors that the company was having trouble with quality control. Reports of overheating issues raised concern, while other companies, like Belkin and Samsung, announced wireless Qi chargers that could charge two devices at once. Samsung's Duo charger came close to giving us what we wanted from AirPower, but it couldn't wirelessly charge three devices at once – it could only juice up two at a time and, crucially, it doesn't support charging an Apple Watch. Apple did tease its charging mat's existence a few times. It updated the official graphic on its site, casually mentioned 'AirPower' in the iPhone XS directions and, most recently, stuck a diagram on the AirPods 2019 box. That's the last we heard of AirPower before now. 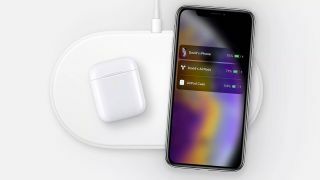 Today, Apple spoke up about its long-delayed AirPower in an email statement sent to TechRadar and other media outlets, and it didn't have good news for fans. “After much effort, we’ve concluded AirPower will not achieve our high standards and we have cancelled the project," said Dan Riccio, Apple’s senior vice president of Hardware Engineering. "We apologize to those customers who were looking forward to this launch. We continue to believe that the future is wireless and are committed to push the wireless experience forward." AirPower was ambitious, but in an age where the Samsung Galaxy Note 7 caused the world to panic, overheating issues cause worse PR. You can still charge your new iPhone and AirPods wirelessly. It just won't be via an Apple product...at least for now. Update: This story was updated to include an official quote from Apple's Dan Riccio.